Contribution in prep -- Fossil Wood from Martha”s Vineyard, Massachusetts for Rocks and Minerals, authors Jim Mills, MillsGeological.com, and Fred Hotchkiss, MPRInstitute.org. anticipated Sept/Oct 2018. Contribution No. 6 -- Growth zones and extraxial-axial skeletal homologies in Asteroidea. Hotchkiss, F.H.C. 2012. Proceedings of the Biological Society of Washington 125(2):106-121. Contribution No. 4 -- Observations on Onychaster (Ophiuroidea: Onychasteridae) (Famennian - Visean Age). Hotchkiss, F.H.C. and A. Glass. 2012. Zoosymposia 7:121-138. Contribution No. 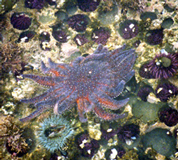 3 -- Arm stumps and regeneration models in Asteroidea (Echinodermata). Hotchkiss, F.H.C. 2009. Proceedings of the Biological Society of Washington 122(3):342-354. Contribution No. 2 -- Bdellacoma in the Hunsrück Slate (Lower Devonian, Germany): Reidentification of Urasterella verruculosa (Asteroidea, Bdellacomidae). Hotchkiss, F.H.C., and A. Glass. 2010. Pp. 15-21 in Echinoderms: Durham, Proceedings of the 12th International Echinoderm Conference, Durham, New Hampshire, USA, 7-11 August 2006, L.G. Harris, S.A. Böttger, C.W. Walker & M.P. Lesser (eds. ), CRC Press/Balkema,Leiden, 679 pp. Contribution No. 1 -- Isolated ossicles of the Family Eospondylidae Spencer et Wright, 1966, in the Lower Devonian of Bohemia (Czech Republic) and correction of the systematic position of eospondylid brittlestars (Echinodermata: Ophiuroidea: Oegophiurida). Hotchkiss, F.H.C., Rudolf J. Prokop and Václav Petr. 2007. Acta Musei Nationalis Pragae, series B Historia Naturalis 63(1):3-18. Asterozoans from the Ludlow Series (Upper Silurian) of Leintwardine, Herefordshire, UK, by David J. Gladwell. Papers in Palaeontology, 2018: pp. 1-60. Phylogenomic resolution of the Class Ophiuroidea unlocks a global microfossil record, by T. D. O’Hara, A. F. Hugall, B. Thuy, and A. Moussalli. 2014. Current Biology 24, 1874–1879. Click here for an electronic version of the Challenger Expedition reports. It is an amazing resource, with text and all the plates as well. Brought to our attention June 2006 thanks to Dr. Philip Lambert, Curator of Invertebrates, Royal British Columbia Museum. This bibliography is compiled by F. H. C. Hotchkiss as a continuing project. It was started in 1971. Over the years Vaclav Petr has been especially helpful in contributing to the compilation. The bibliography is added to and edited as time permits throughout each year. The bibliography is annotated at the whim of, and for the benefit of the compiler. The compiler disclaims any standard of completeness or consistency for these annotations. There is a working copy MS word file for each letter of the alphabet. Approximately once per year the latest version of the files is converted to pdf files that are put onto the MPRI website to share with scientists, students and the interested public. We hope that it will be of use to you. Click on the letters A to Z to access the bibliography.